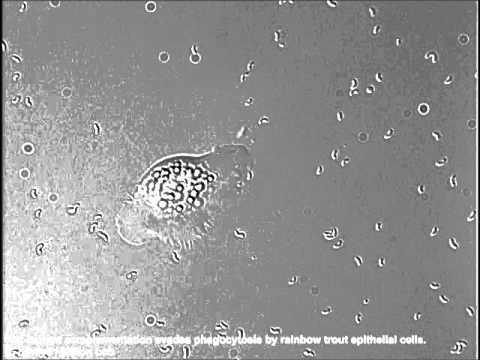 This video shows the ability of completed mutant to evade phagocytosis by the rainbow trout skin epithelial cells. Skin epithelial cells were isolated from rainbow trout and infected with 105 bacteria ml−1. Following infection, phagocytic activities of motile epithelial cells were tracked using live-cell microscopy. 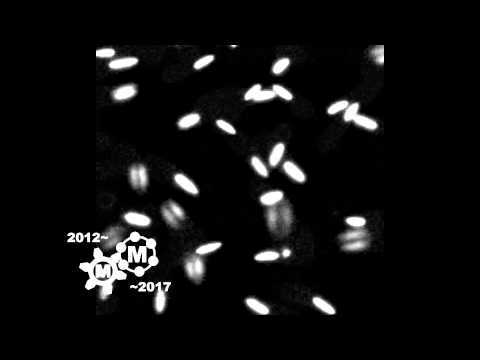 This video is representative of epithelial cell interactions also associated with the Δwzm and ΔwbhA mutants carrying the respective complementing wild-type gene. 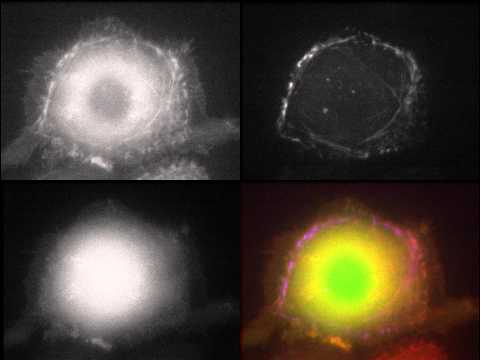 All three complemented mutant strains regained the ability to evade phagocytosis. 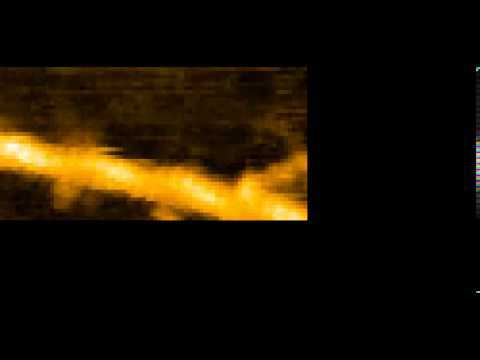 High speed AFM observation of growth of a cofilin cluster toward the pointed end of a filament. AFM images of actin filaments have double-helical appearance, with alternating bright and dark patterns. 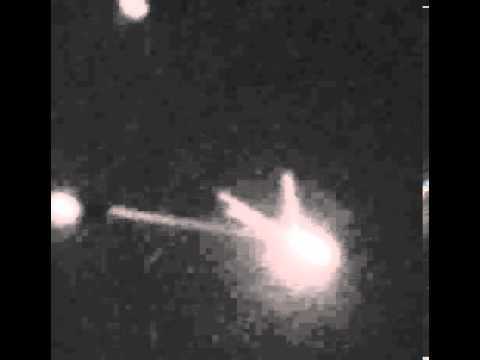 The bright areas are the tall parts of the filament, where the two protofilaments align vertically (peaks). 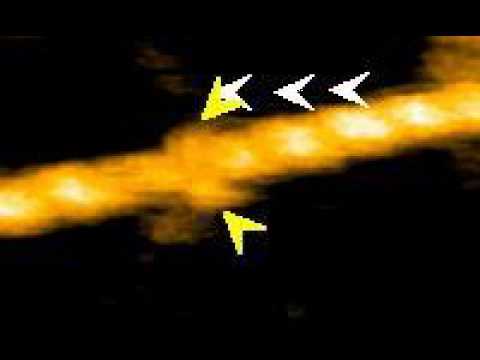 Cofilin binds cooperatively to actin filaments, forming clusters. Those cofilin clusters are identified in AFM images as brighter peaks, due to thickening of the filament, and shorter helical pitch (distance between the peaks) representing “supertwisting”. Cofilin clusters grow unidirectionally toward the pointed end of the filament. White arrowheads show growth of the cofilin cluster, and yellow and magenta arrowheads show binding of S1. Magenta arrowheads indicate S1 molecules whose binding angle could not be determined, either for geometric reasons (i.e., binding on the upper face of the filament) or because the binding was too short-lived. Cofilin clusters grew unidirectionally to the pointed end direction in the presence of ADP only or ADP+Pi, indicating that this is independent on the gradient of chemical states of actin subunits along the length. For details, please see the original paper linked below. Conditions: F buffer containing 1 mM ADP, 0.1 mM ATP, 20 nM S1, and 75 nM cofilin. Imaged at 2 frames/s and played at 5 frames/s. The width of the imaged field: 280 nm, Z-scale: 0–12 nm. Mertz, A.J., So, M. and Sheetz, M.P. Pilus retraction powers bacterial twitching motility. Nature 407, 98-102 (2000). Skerker, J.M. and Berg, H.C. Direct observation of extension and retraction of type IV pili. Proc Natl. Acad. Sci. USA, 98, 6901-6904 (2001). 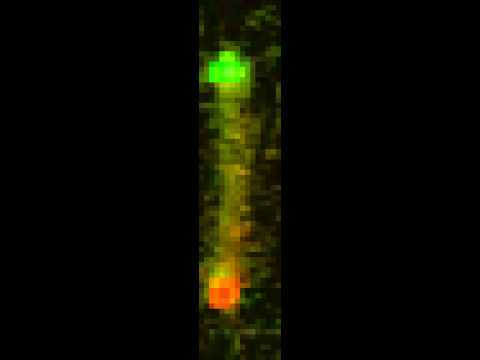 How do Myxococcus cells direct their motility? 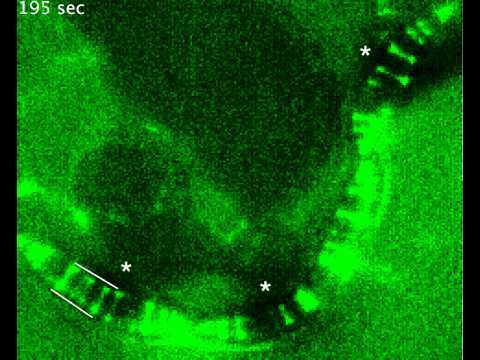 Myxococcus cells can change their direction of movement by a process called a reversal where the poles exchange roles, allowing the bacteria to rapidly move in the opposite direction. Such rapid directional changes result from pole-to-pole switching of a central Ras-like small G-protein, MglA. Genetic control of these switches is at the heart of the Myxococcus multicellular lifestyle, swarming, prdation and fruiting body formation. How is MglA localization controlled dynamically? What signalling pathways control MglA localization? 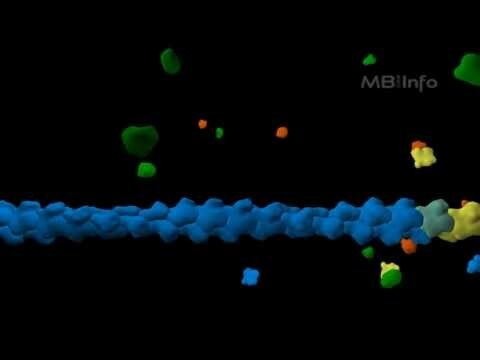 How is MglA regulating motility? How are those regulations affecting cell-cell cooperation in groups? For more information, see Mignot et al. (2005), Mauriello, Mouhamar et al. (2010), Zhang et al. (2010). この実験ではリポソーム内にZリング（細菌の分裂装置）を再構成するために、 人工的な膜結合型のFtsZ を、YFPでラベルしたFtsZのC末端に両親媒性ヘリックスを導入することにより構築した(FtsZ-YFP-mts) 。この動画は、精製したFtsZ-YFP-mtsがGTPにより重合し、 大きなZリングをチューブ状の多重リポソーム内に形成することを示している。Zリングの形成と収縮に他の細胞分裂関連分子は必要なかった。また再構成されたZリングはin vivoのZリング（動画：Zリングの形成と収縮2を参照）と良く似た動態を示した。 参考文献 1. Reconstitution of contractile FtsZ rings in liposomes. Osawa M, Anderson DE, Erickson HP. Science. 2008 May 9;320(5877):792-4. 2. Inside-out Z rings--constriction with and without GTP hydrolysis. Osawa M, Erickson HP. Mol Microbiol. 2011 Jul;81(2):571-9. 3. Chapter 1 - Tubular liposomes with variable permeability for reconstitution of FtsZ rings. Osawa M, Erickson HP. Methods Enzymol. 2009;464:3-17.